The end of an Era on so many levels: Showrunner, Doctor, supporting characters, standard definition. Rassilon returns, madder as a hatter, and as cross as a crossword puzzle. He and the Time Lords are locked in a timeless bubble if you will, and for good reason, I might add. 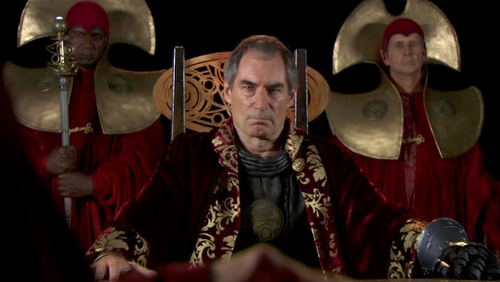 If Rassilon and the Time Lords are released, they will complete their mission, to rid reality and time itself, which the Doctor knew, and that is why he chose to use the Moment. I know. Spoilers. Ashford and Siskoid discuss the End of Time by Russell T. Davies. Ashford mentioned that there is a way to read an early draft about Day of the Doctor, featuring Christopher Eccelson's Doctor before he turned it down. Please click the link below this sentence.